If you have never used an IWB holster before, it would not hurt to scroll down to get a better understanding of its popularity. The IWB holsters (good ones, anyways) are easy to conceal and keep you and your gun safe and secure the whole time. They are supposed to be subtle, with a low profile and to bring comfort, no matter if you stand/ walk or sit down. Taking a look on the market lets you see that there are so many models out there, made with various materials. Either you settle for a leather IWB holster or a Kydex one, the most important thing on your holster is to bring you comfort and safety, no matter how much you move. A leather IWB holster brings on the table not only an elegant appearance and a nice smell (that’s quite a thing for some), but also durability and a good snug fit to your gun. Many leather IWB holsters fit in fact several gun models, making the leather holsters more versatile. Kydex is another great material used for the IWB holsters that stands out with its toughness and custom fit for your gun. You may also settle for a hybrid holster that combines both leather and Kydex so you get a durable, tough holster that looks nice and elegant, with minimal risk for irritating your skin. Never forget to throw an eye on the features of your holster. The more adjustments you’re able to do, the better the chances your holster is versatile and able to serve you well in various situations. You may get IWB holsters that present adjustable ride height and adjustable retention so it’s important to know what your IWB holster is able to do. A fast drawing and re-holstering, easiness on use are also important details you should check on your holster. Either you want your IWB holster for a specific gun model or for several models, it’s essential to know exactly what you are buying for the IWB holster. In addition, it wouldn’t hurt either to check your wallet before shopping as the extra buck may mean the whole world for the efficiency of your IWB holster and your gun. Ready to wear right out of the box, the Alien Gear Holsters Cloak Tuck 3.0 IWB Holster is comfortable from the very first time and needs no time to break in. 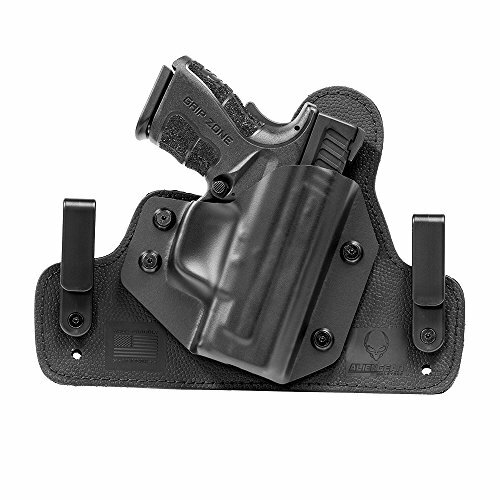 We like the holster for its performances also as it conceals very well and is highly adjustable. You may set the ride height, but also the cant and the retention. All of these adjustments are easy to do and give you the ability to have the right settings in various situations. The holster is tough, yet very flexible as it’s made with neoprene and presents a soft base. The holster is well made and comfortable, feeling nice against your skin. The thermoelastic polymer used doesn’t scratch your gun nor your skin either. The universal shell system that allows you to swap shells for different models is essential feature of the holster. You basically may use the holster not only for your 1911, but also for some other models. The holster also comes with strong clips that keep everything in place, just as they should. Well-made and with a waterproof back pad, the holster is a great investment anytime. All in all, for its versatility, reliability and durability, the holster still remains a great option for many gun models, not only your 1911. Compact and lightweight, The Ultimate Suede Leather IWB Holster is not only handmade here at home in our USA, but also a great option that comes for a very good price. The holster is made with genuine USA suede leather and doesn’t include any synthetic materials. Even though it’s rather lightweight and compact, the holster still presents a rugged built and offers a snug, custom fit to your Glock 19. Its design is well thought out though and offers a good fit for some other gun models: Sig P239, S&W M&P, and S&W Shield. The design allows you to get fast and easy access to your gun and a fast concealment every time. The retention is reliable and the holster stays in place, with minimal risk for shifting. The tough belt clip does a good job and keeps everything nice and in order. The low profile of the holster brings minimal printing, which is great for an IWB holster. The holster is very well made and the high quality craftsmanship adds up on the list of good things. Never mind the cons though as, for the little money you pay, you get a dependable, comfortable, low profiled holster that does a good job for you and your gun. For those of you out there who would rather get a Kydex holster (for various reasons), a dependable option for your Glock 23 is the Galco Triton Kydex IWB Holster for Glock 19, 23, 32. As you can see for yourself, the holster fits more than your Glock 23, but this isn’t its only good quality. The holster is made of Kydex so it’s very easy to take care of (or, to put it better: it doesn’t need any special attention at all). Kydex is a tough, long lasting material, the holster is sure that way, and its built only completes the qualities of Kydex. This holster is built to last a long time, even when heavily used. The performances of the holster match its built and we sure like the fact you can re-holster fast and easy. The draw is also fast and the retention is adjustable. It’s easy to conceal and the belt clip keeps the holster nice and in place. The holster fits belts up to 13/4”. The holster features a sweat guard that keeps at distance corrosive perspiration from you and your gun as well. 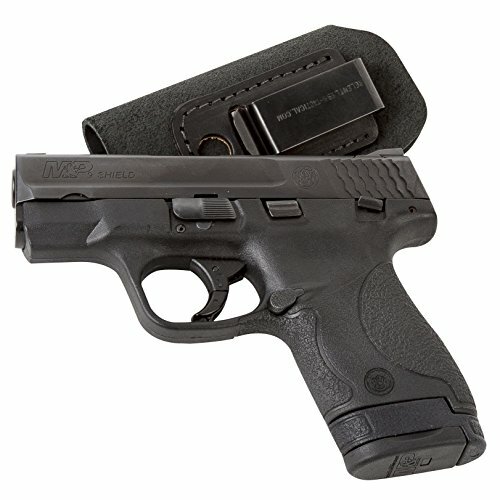 We like the holster for the solid construction and nice finish and its body design as well. All in all, you get a durable, tough and dependable holster that brings only few minor drawbacks to consider. The very popular Concealment Express IWB KYDEX Holster brings many things on the table, which explain its popularity and value. The versatile holster is made here at home in our USA and the strong Kydex makes it durable and ready to take the intense use. Despite its material, the holster has a decent profile that doesn’t imprint and it’s very comfortable all day long. The minimalist design is efficient and dependable. The good profile helps the holster not to dig, becoming a nice choice for the big guys also. The adjustability of the holster is another thing to talk about also. You may actually set the retention and decide every time the carry angle, choosing from 0 to 15 degrees. The holster includes also a “Posi-Click” feature that lets you hear nice and clear every time the gun is securely holstered. The retention is dependable and the sight channel is good. The drawing is smooth every time. The holster stays in place and doesn’t shift away, no matter how much you move. 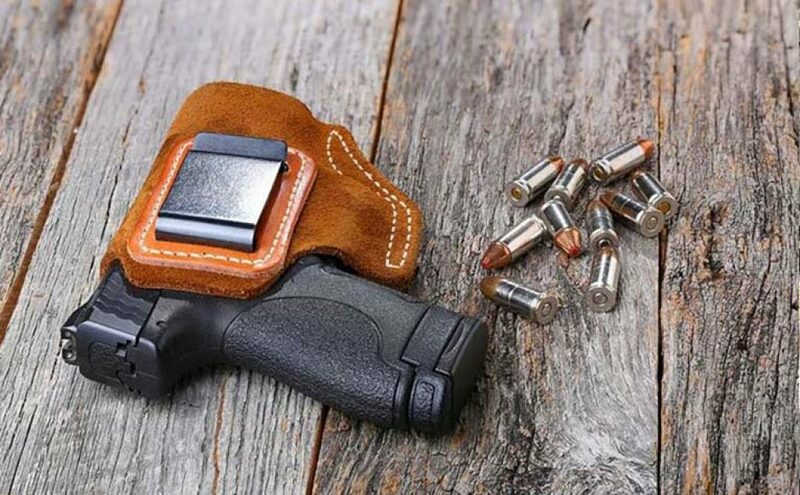 The holster also features a sweat shield that keeps corrosive perspiration away from you and your gun, expanding the life span of your gun and the holster itself. Additionally, the holster doesn’t irritate your skin either. Built here at home in our USA, the holster may be one of the most loved holsters out there for all the right reasons. We decide the see the bigger picture that gives us a dependable, versatile, comfortable IWB holster that is so popular out there. Hand molded to give the best fit to your gun, the CrossBreed Holsters SuperTuck Concealed Carry Holster is not only versatile (it fits several Glock models: 17, 19, 23, 25, 31, 34 &35) but also dependable and secure. CrossBreed Holsters patented the holster and its design ensures fast and easy concealment every single time. The backing is made of cowhide leather and it’s hand painted in black. This gives the holster a soft touch, with minimal risk for irritating your skin. 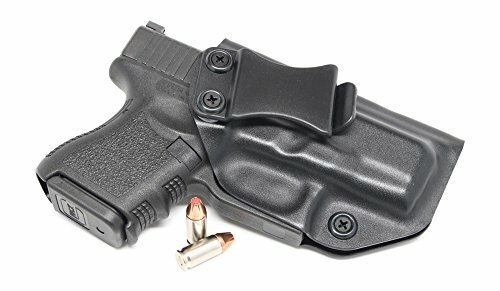 The molded and mounted Kydex pocket is durable and helpful, completing the design of the holster. We also need to notice the adjustability of the holster and you get to adjust the cant and the ride height according to your needs in various situations. The SnapLok powder coated steel belt clips increase the versatility and adjustability of the holster also. They have a modular shape, so they are also comfortable. The holster is very well made and the craftsmanship really stands out. It’s comfortable to wear and so versatile. For the amazing craftsmanship, durability and versatility, the holster is a great investment of your money, despite its minor flaws. When it comes to IWB holsters, some consider that once you get a Tulster, you can never get something else. You need to try it once to get a better understanding of this or at least to scroll down to make an idea on a Tulster holster. The Tulster Profile Holster IWB is designed for the Glock 26/27/28/33 Holster and impresses with its looks. The fit and finish are great and impossible not to notice. The holster is more than meets the eye though and the impressive look completes with the list of features. For the example, the positive retention is adjustable and the audible “click” lets you know when your gun is safely holstered. A retention screw helps you do the right adjustments and you may set the angle on the holster from 0 to 15 degrees. The risk for irritating your skin or damaging your gun is minimal as the holster features a full sweat shield that protects against the corrosive perspiration as well. The sweat shield also gives you indexing point. The concealment is great and this also because of the minimalist design and minimal usage of material. The trigger guard is undercut so you get a higher grip on your gun. The magazine may be release even when your gun is fully holstered. We also need to talk a bit about the belt clip that is injection molded and the soft loop option that increase the versatility of the holster. The 1.5” Quick Clip helps you put on/take off the holster fast and easy. Regardless the minor issues, we’re way too impressed with the good things that give us a nice looking, versatile, dependable and highly concealable holster. 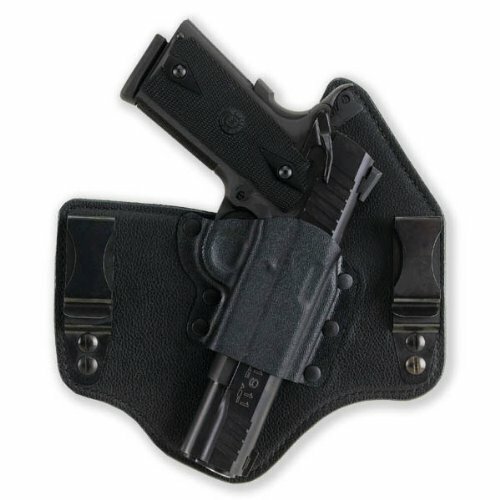 For those of you who are not familiar with the materials used for the IWB holsters, it’s important to know that Boltaron is also a tough, dependable option used on many models. The CYA Supply Co. IWB Holster Fits: Glock 43 is made in our USA using Boltaron, a strong thermoplastic material that takes very well few falls and temperature also. Some even say the Boltaron gives a better fit than Kydex, but you need to decide that for yourself. The holster presents good adjustability and you may set the carry angle from 0 to 15 degrees, according to your needs. The drawing is smooth and easy and re-holstering isn’t difficult either. The design of the holster is efficient on many levels and the ability not to mar the finish of your gun is just one of them. Additionally, the holster also feels nice against your skin, not irritating your skin either. The smooth edges protect your skin and your gun altogether and improve the looks of the holster. The holster doesn’t dig into your skin, increasing comfort on the wear. Now that we’re hear, keep in mind the holster is lightweight and easy to carry throughout the entire day. 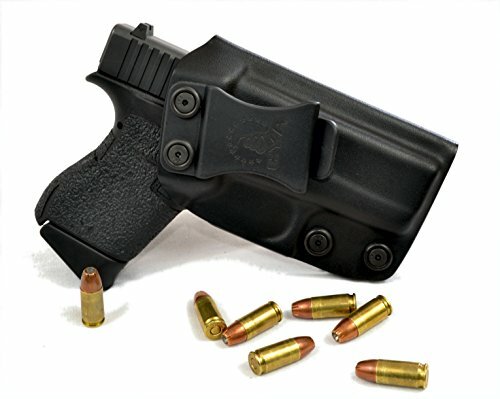 The holster features a strong, durable clip that keeps the holster in place. The holster clicks in and ensures solid retention. The holstering is easy and guided and the holster comes set up at right cant. We also like the subtle snake logo on the holster that completes the description of a lightweight, dependable holster that comes for a great price also. All things considered, we still like the holster for all the good things it brings on the table and try to focus on that, and not the minor issues that are tangling along. You don’t need to be a scientist to realize right from the beginning that the Defender Leather IWB Holster is a versatile holster as it fits so many gun models. The holster gives a nice, snug fit for many Glock models (17, 19, 21, 23, and 26), but also for: Springfield XD & XDS, Sig P239, and S&W M&P Shield. The holster is made in our USA so for many, the following description becomes almost useless. The holster is very well made, using genuine USA bull hide leather and doesn’t include any synthetic materials into its making. The stitching is impressive and gives the holster a durability vibe. As most leather IWB holsters out there, this one also needs a couple of days to fully break in, but it’s totally worth the wait. The design of the holster is well thought-out and the holster is form-fitted, giving a snug fit to your holster, without the bulky feeling. Talking about the performance, we need to mention the fast and easy concealment and good retention. The holster features a metal clip that keeps it in place and is as tough as the holster. The holster has a sturdy construction and is worth every single penny (they’re not that many either). It comes with a Lifetime Warranty, so you can rely on its durability. 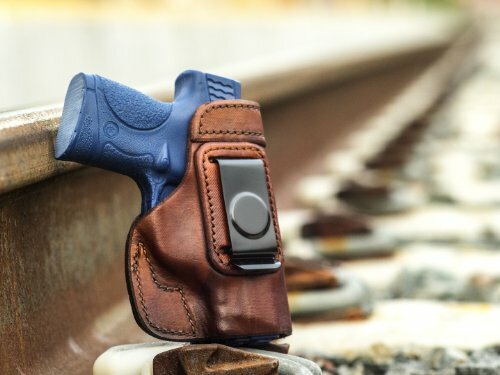 For the money you pay, you don’t end up with a lemon, for sure, but you get a reliable, versatile and comfortable holster that is made in our USA with genuine USA leather. It’s not that we’re praising on the hybrid holster, but when you get a holster like the Springfield XD-S 3.3 IWB Hybrid Holster, it’s difficult to get another type of holster ever again. The holster is made with genuine suede and Kydex and it’s the result of combining great quality materials. To the materials adds up the Kevlar stitching that joins leather and Kydex for as long as you can think of. The tough built doesn’t stop here though and continues with polymer stiffening insert and soft suede backing. What do you get? A tough, yet so comfortable and flexible holster, despite its impressive built. Either you jump or walk, the holster doesn’t bring any discomfort. You may sit down for hours without even noticing you still wear your holster. The holster presents a rather rounded profile, which sustains the comfort. 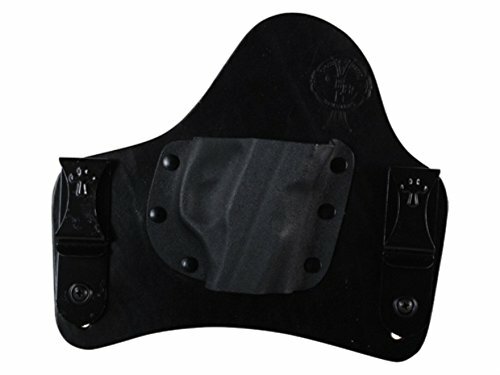 We also need to mention the sweat guard protection on the holster that keeps away from you and your gun the perspiration, expanding the durability of both the gun and the holster itself. The holster stands out also with its adjustability that lets you have the right settings on cant, height and retention as well. The belt clips are strong and adjustable and the double attachment points to the belt keep the holster nice and steady, no matter how high you jump. The printing of the holster is minimal and the holster has a natural feel to it. It also feels nice against your skin and you may have the holster for quite some time. The more we look at it, the more we like it though and almost don’t notice the minor issues that come along. For some, Kydex is the best material for their IWB holster and a holster like the Multi Holsters Elite Smith & Wesson M&P Shield 9/40 IWB is a perfect example for the durability and reliability. The holster is made here at home in our USA with Accu-Pressed Process, which means your gun fits so nice and snug. The holster is very well made and stays in place, no matter your moves. 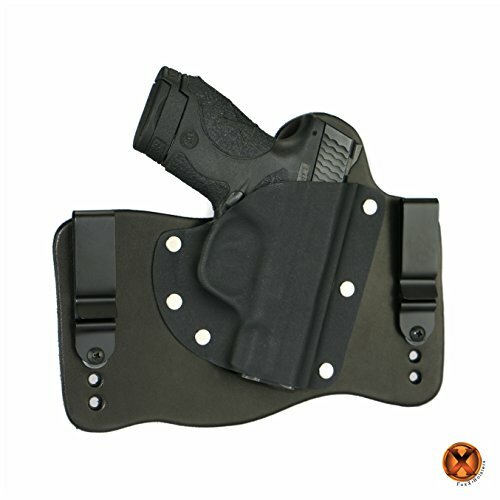 As a matter of fact, when you move around, the holster tilts slightly for more comfort on the move. The adjustable tension is one great feature on the holster and it’s easy to tighten/loosen the screws for it. You may also set the right cant, as the holster presents an adjustable carry angle that may be set from 0 to 15 degrees. 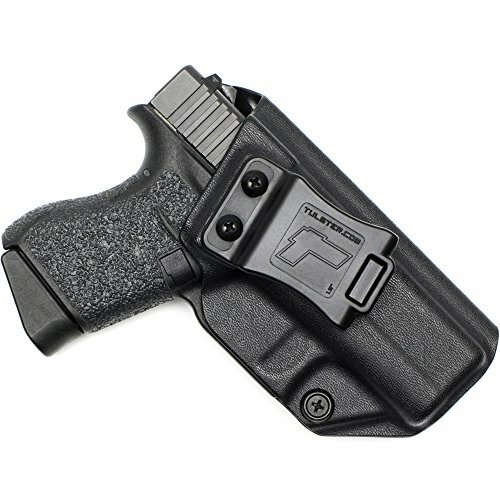 A FOMI clip on the holster keeps it in place, safely attached to your belt. The single clip is wide and fits the tough construction of the holster. You may use the holster on 1.5” belts. Removing the holster is always fast and easy and the reverse tab is a great little helper. The retention is good and the positive click is functional. You get to draw easy and smooth every time and even remove the holster with just one hand. We also notice a body shield that keeps at distance the corrosive perspiration, protecting your skin and your gun as well. 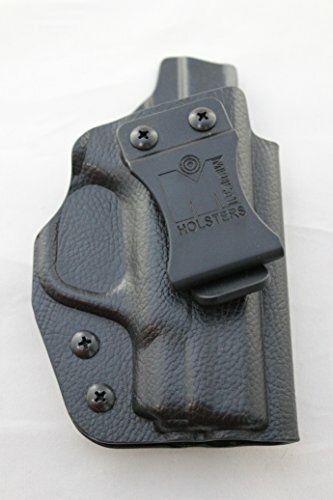 The holster has nice finish, feels lightweight and has a slim profile. The printing is minimal and the holster is very easy to use. All things considered, as it’s very well made and dependable, the holster remains a great choice to have in mind when in need. We like the Galco KT652B Kingtuk Inside the Waistband Gun Holster for S&W M&P Shield 9/40 for many reasons and the reliable performances on so many levels is just one to begin with. The holster is a hybrid type, made with leather back panel and molded Kydex front panel. 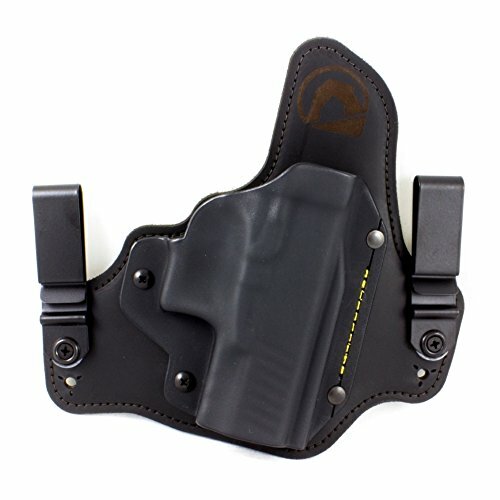 This construction helps the holster easily conform to the curves of your body, for more comfort at all time. The backing plate is made with Napa leather front and saddle leather, thus explaining the short break in time the holster needs. 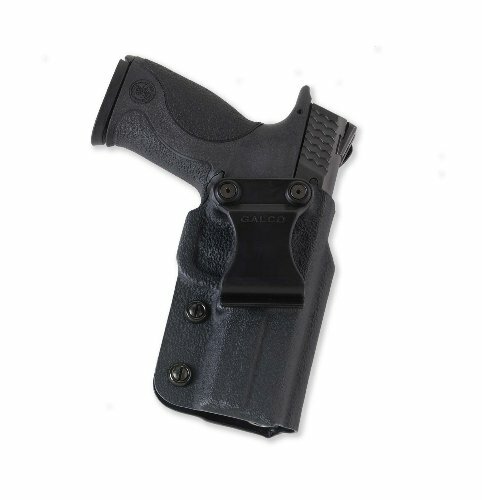 The holster features a rugged Kydex holster pocket, giving you speed and easiness when drawing or holstering. We also have to mention the interchangeable injection molded nylon C-hooks that keep the holster nice and steady. The holster fits belts up to ¼” and its C-hooks increase the concealability and the low profile as well. The metal clips on the holster are tough and fits belts up to 1-3/4”. You don’t need to worry about the retention as it works just fine every time. 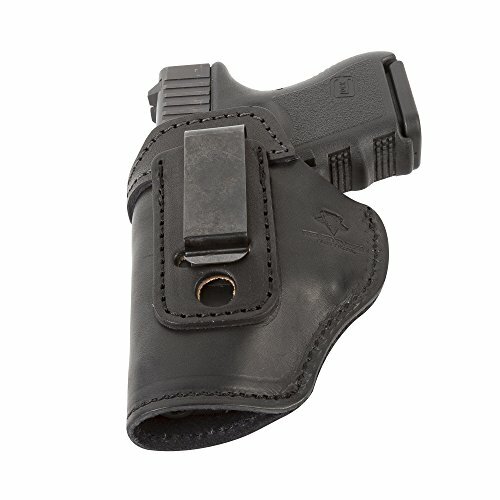 We also like the balance on the holster and its durable built, with tough stitching. No matter the cons, when in need for an IWB holster for your S&W M&P Shield, don’t hesitate to give this one a try. Giving a nice, snug fit to your gun, the FoxX Holsters Smith & Wesson M&P Shield 9mm & 40 IWB Hybrid Holster Tuckable is reliable and hides very well underneath your clothing, without sacrificing your safety. The holster is a hybrid model that combines leather and Kydex, so you know it’s going to look (and smell) nice, for a very long time, no matter how often you use it. You may feel the holster a tad stiff in the beginning, but don’t worry; the holster gets softer and more comfortable the more you wear it. The adjustability of the holster is also something worth to talk about. You may set the ride height and the forward cant, which increases its versatility. The tension is good and the holster conceals very well. It’s easy to draw and to re-holster. The holster has a rather low profile so you barely notice underneath your clothes. The low profile is surprising if you take a closer look at the rugged built. The holster doesn’t shift away and stays nicely in place thanks to the tough black steel belt clip. The holster is made with high quality materials and comes at a great price, considering its value. The minor problems aren’t deal breakers for us and we definitely consider the holster to be a great choice when in need. Comfortable and made here at home in our USA, the Outbags LOB3S-SHIELD Brown Genuine Leather IWB Conceal Carry Gun Holster for Smith & Wesson M&P SHIELD 9mm / 40 S&W gets better with each wear.